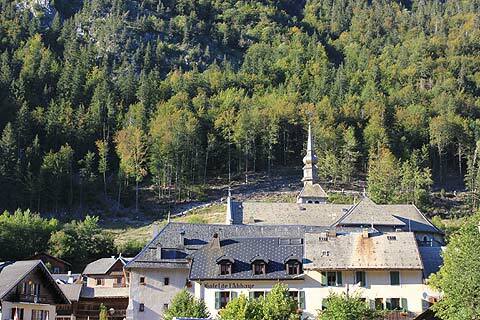 Abondance is an attractive alpine village best known for its abbey. It is 30 kilometres from the southern end of Lac Leman and Evian-les-Bains. 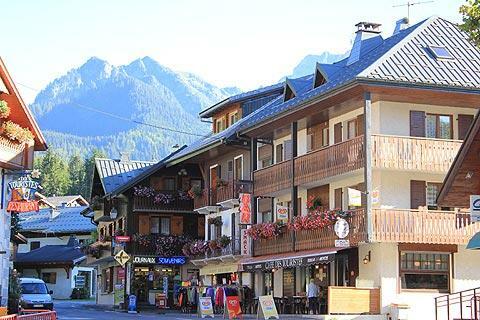 Even before you arrive in the village, the drive to Abondance through superb scenery is absolutely fabulous. Even in September some snow tipped peaks could be seen. The village is in a splendid position with mountains all around. Its abbey sits perched on the hillside slightly above the town and below it Abondance stretches out along the banks of a mountain stream. 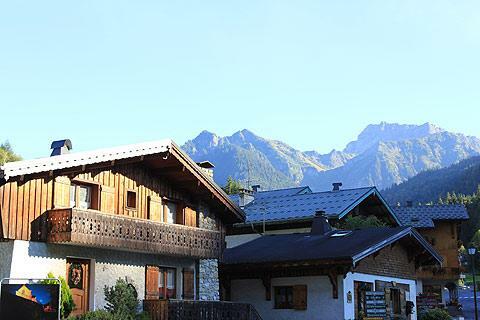 The house in the village are in typical alpine style with steep rooves and largely wooden built. 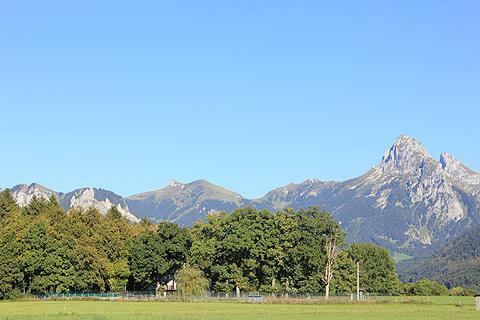 Abondance sits at an altitude of 1000m and above it are the Mont de Grance mountains (2432m), Mont Jorat (1830m) and the Pic de la Corne (2084). 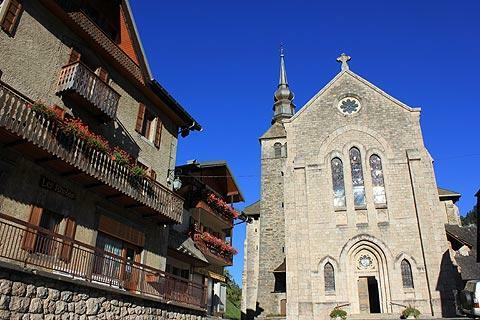 The village of Abondance developed here after the Abbey of Abondance was built in the 12th century. It is built in mountain Gothic style and inside are various artistic treasures including 15th century murals in the cloister and 19th century trompe de l'œil paintings in the abbey church. The cloisters are particularly beautiful with their arches looking onto a small grass courtyard and the arches on the inner wall painted with really lovely 15th century murals. Painted cloisters such as this are rare in France, although more common in Italy. The church steeple has the attractive bulbous base which is often seen in this area. Be sure not to miss a visit to the abbey if you are in nearby. 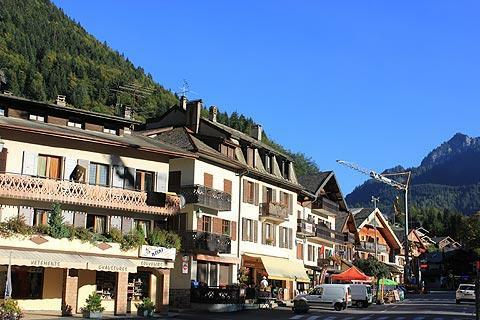 Whilst in Abondance you can visit the Maison du Val d'Abondance which describes village life related to the cattle and the important cheese making industry. Inside the Maison du Val d'Abondance you can see a typical mountain chalet house, cheese making equipment and a display of cow bells. You can also look through a large window into the cave where hundreds of large cheeses are slowly maturing. In the summer some of the villagers stay in the village to make hay for the cows to eat over winter. Meanwhile others go up the mountain with the cows and make the famous Abondance cheese. As winter approaches the cows are brought down to the village and stabled for the winter. The cheese is put into a cave to mature. In the shop you can sample and buy cheese, as well as local apple juice and white Savoie wine. Abondance is a skiing village in the winter and the telecabine sets off from the centre of the village to a range of pistes. 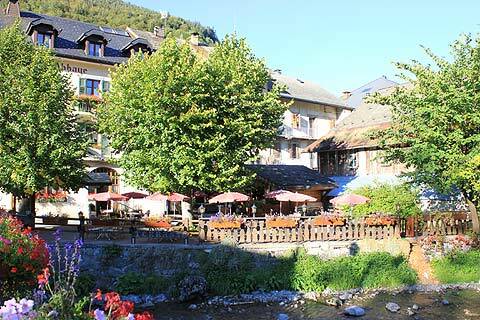 Abondance is particulary suited to beginners and families. There is a free bus taking skiiers to other ski stations in the Portes du Soleil ski region.